The thirteen waved (‘luk’) Sepokal dapur is very hard to find, and therefore it is considered an extremely rare model. This particular keris Sepokal is made in the tangguh Blambangan era (1294–1474 CE). In the old days, the keris Sepokal was commonly used by soldiers at the royal palace (‘keraton’). Hence, this dapur features a rather practical design, for the blade has a plain gandik and comes without any sophisticated ricikan. However, the simplicity of the dapur Sepokal certainly should not be overlooked, for indeed, its subtlety proves the fact that less often really is more. When we examine the exterior surface of the ancient iron blade of this rare dapur, we can see that it features a highly unique pamor pattern. This is, of course, the beautiful Raja Gundala motif, which is extremely rare indeed. Pamor Raja Gundala is a so-called pamor tiban, meaning that the pattern emerged spontaneously, without the empu having planned to forge this motif beforehand. The Raja Gundala pamor pattern represents a two-dimensional image of a human, animal or spirit being, which can be seen at base of the blade. As can be seen from the pictures, this keris Sepokal thus features a pamor motif which resembles a human figure. The image symbolizes a person sitting in meditation posture. The head shows remarkable similarities with a Buddha or a rêsi (seer). Hence, any ancient pusaka featuring pamor Raja Gundala is considered an invaluably sacred heirloom. 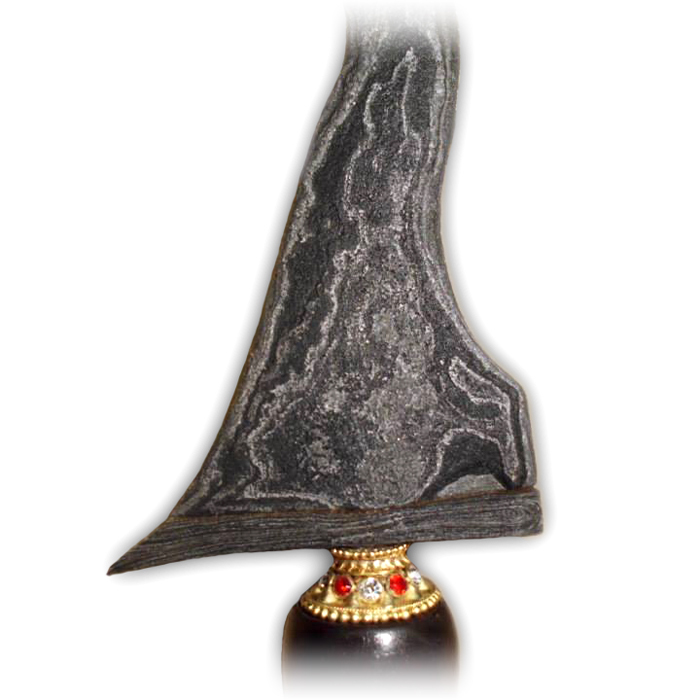 Likewise, the keris Sepokal with its Raja Gundala motif is believed to possess extremely powerful mystical properties. 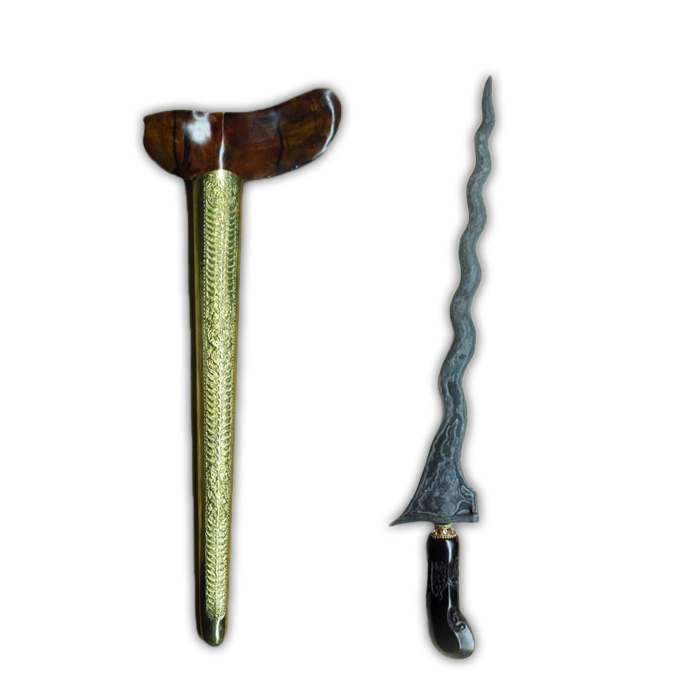 These mystical powers are said to protect the owner of the keris in dangerous situations, and thus a keris with the Raja Gundala pamor motif can even help prevent accidents and avoid harmful circumstances. For this reason, Indonesians commonly believe this sacred kind of pusaka item to be highly effective to ward off evil spirits, ghosts, demons, jinns. 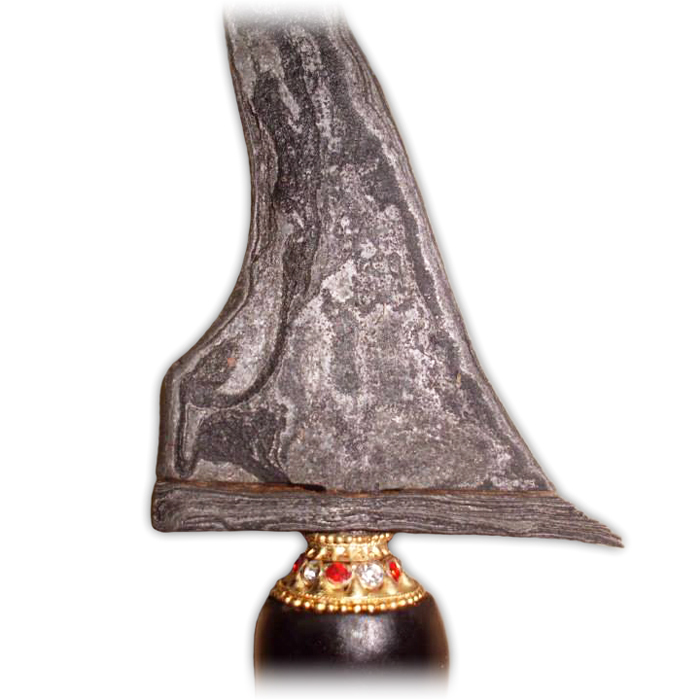 As such, the keris Sepokal is very useful to defend oneself against the dangers of black magic (‘guna-guna’). This luxurious heirloom keris is attributed with an exquisite scabbard made from tamarind wood, which has a natural bold red color. Its density and durability makes tamarind wood the preferred material for a high-quality warangka. 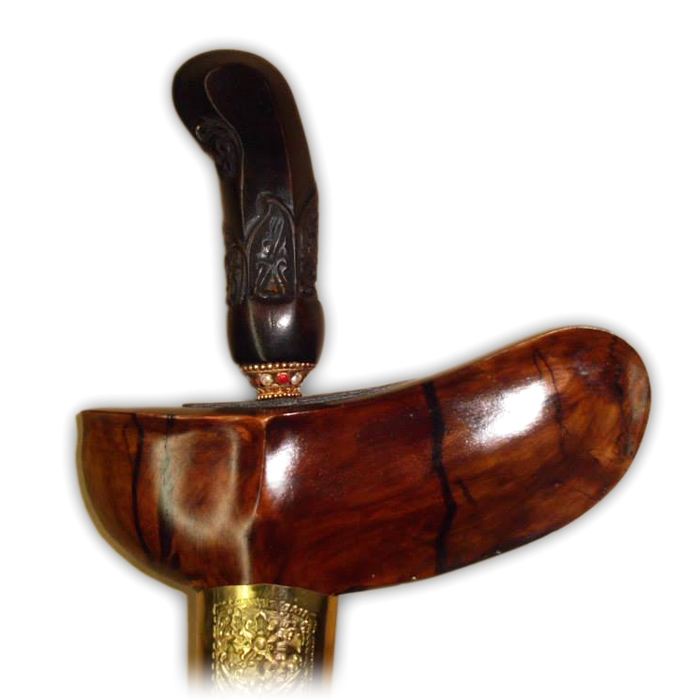 The sheath is hand-carved in the traditional gayaman model of Yogyakarta.